Below are some of the game products designed by Idea Duck and licensed to various manufacturers. Click on the small images below to jump down the page and get more information about the product. Qwirkle is Idea Duck's most popular product. 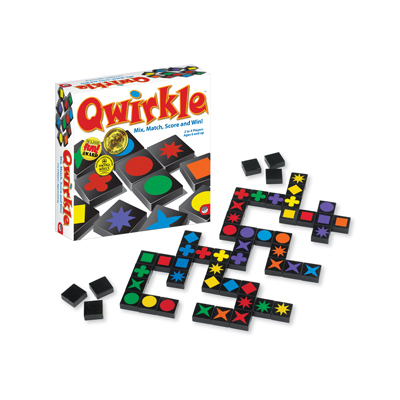 Qwirkle consists of 108 thick wooden tiles. Players take turns building lines that are all one color or all one shape. The game is all about figuring out the very best place to play your tiles - you can score lots of points if you play in multiple lines or finish a line of six. Qwirkle is simple enough for children 6 and up to play. However, if you're playing with experienced gamers it turns into a much more strategic game. To see additional information and links about this game, check out the Qwirkle page. 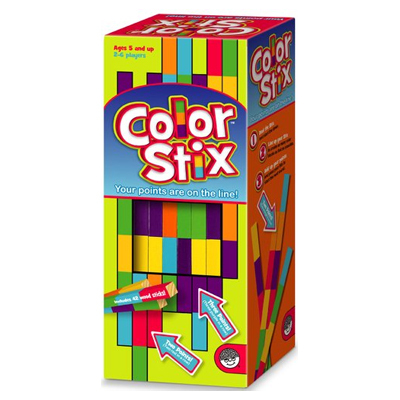 Color Stix is a hands-on game of speed and visual thinking. First divide the colorful wooden sticks evenly among the players. Players then race to line up rectangles of the same color to make color blocks. Each rectangle in a color block is worth one point, so arrange and rearrange your sticks to maximize your point total. Do the best you can with your set of sticks before the timer runs out. Then pass your sticks on to the next player – so each player gets a chance to play with every set of sticks. For 2 to 6 players. Ages 5 and up. And be sure to look at Three Game Party for pictures from the Color Stix release party. 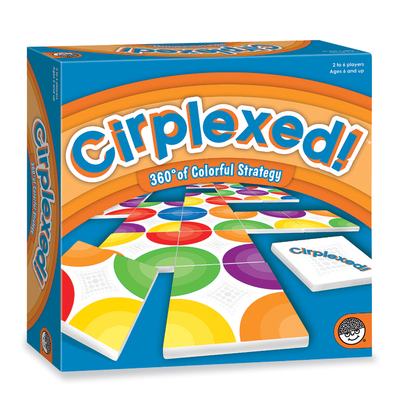 In Cirplexed, strategy comes full circle. Everyone plays at the same time, drawing and placing tiles to construct single-color circles on their individual game boards. It takes visual thinking and 360° of colorful strategy to maximize your score. For ages 6 and up. 2 to 6 players. Brave baby owls like to explore the nighttime forest. However, they need to get back to their nest before the sun rises or mama and papa owl will be worried. Can you help them get home in time? This cooperative game lets players work together to get the owls home. 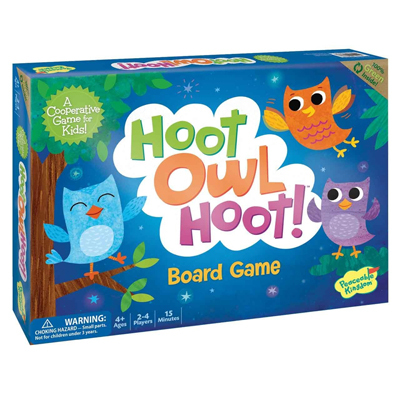 Players “fly” the owls around the board by playing colored cards. Beginning players try to get 3 owls back to the nest. As players get better at the game, they can try to get 4, 5, or even 6 owls home before the sun comes up. For 2 to 4 players. Ages 4 and up. And be sure to look at Three Game Party for pictures from the Hoot Owl Hoot release party. Vroom, vroom, you’re in a race to see the USA. You get a fully detailed rubber car token to cruise around the game board map. Use your cards to navigate the continental United States. “Cruise Control”, “Alternate Route” and “Fly” cards add twists and turns to the journey. Players race from destination to destination, trying to find the best route around the country. The goal is to earn the most points by gathering state chips and destination cards. Along the way, players learn about geography, landmarks, national parks, and historical sites. 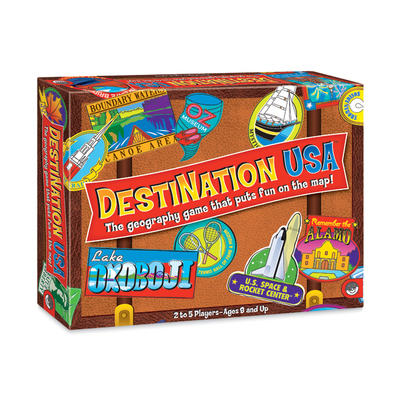 DestiNation USA was designed by Christopher Ross. For 2 to 5 players. Ages 8 and up. And be sure to look at Three Game Party for pictures from the DestiNation USA release party. 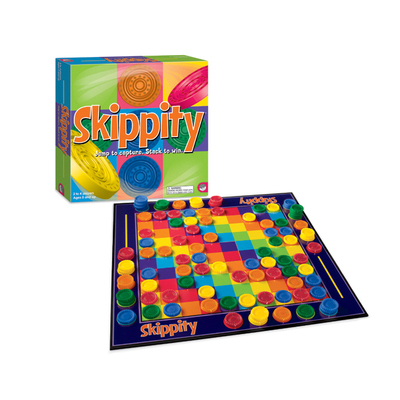 Skippity is easy to learn and fast to play. Any piece can be your jumping piece; they’re all fair game! Use straight-line leaps and capture every piece you jump over. Capture the colors you need while blocking your opponents from capturing the colors they need. When you have one piece of each color, it’s a set. The player with the most complete sets wins. For 2 to 4 players. Ages 5 and up. And be sure to look at Skippity Party for pictures from the Skippity release party. 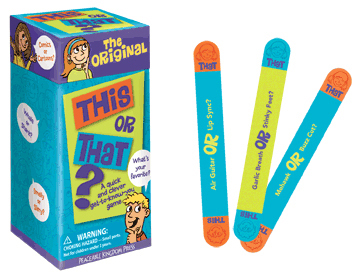 This or That is a fast and fun get-to-know-you game! You take turns drawing a stick from the box. Read the question on the stick out loud. Penguin or Polar Bear? King Tut or King Arthur? Lemonade or Hot Chocolate? Pick which one you like the best and let your friends try to guess which one you picked. Score a point every time you correctly guess what your friends prefer. It’s not uncommon for the players to stop keeping score and just have fun talking about the choices. Ages 6 and up. 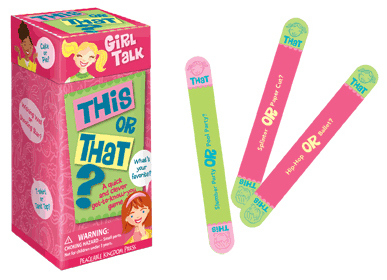 The Girl Talk edition of This or That plays exactly like the original version. The only difference is that some of the questions are a little more orientated toward girls. President or Queen? Ballet Slippers or Soccer Cleats? Ponytails or Braids? Fairy or Princess? Slumber Party or Pool Party? Speaking of slumber parties, this would be a great game play at a slumber party. Ages 6 and up. 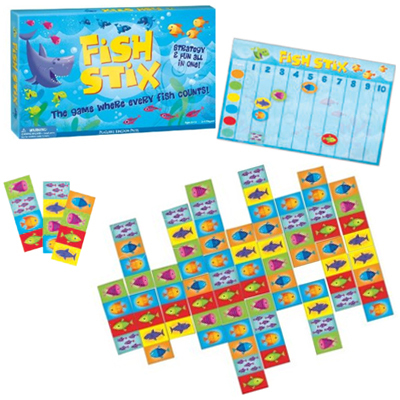 Fish Stix is strategy and fun all in one – it’s the game where every fish counts! Fish Stix is a simple visual strategy game that’s fun for children of different ages to play together. Add your fish stix to the board and score points for all the fish in a school. This product is the proud winner of a 2009 Parents' Choice Gold Award! Ages 6 and up. Art by Chris Lensch. Flippity Frogs is the fast-flipping game of high-flying fun! Use the seesaw flipper to flip your frog onto the pond. If you land on one of the pieces in the pond, you get to keep it. The game requires minimal reading and teaches simple addition as well as hand-eye coordination. Ages 4 and up. Art by David Sheldon. 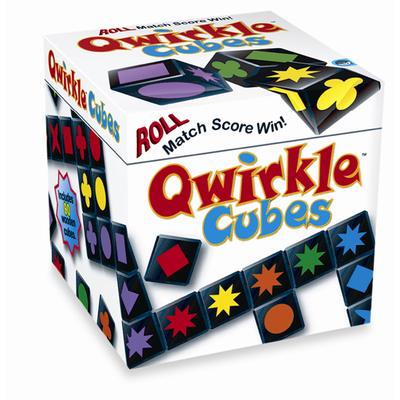 I’m so excited about Qwirkle Cubes, the sequel to Qwirkle. It plays much like the original game - players strategically build color lines and shape lines - but Qwirkle Cubes gives you the potential to improve your hand every time you roll the cubes. Everyone plays open-handed, so players can better judge their opponents’ future plans. The game offers increasingly strategic scoring opportunities, as you decide which cubes to roll and which cubes to play. To see additional information and links about this game, check out the Qwirkle Cubes page. 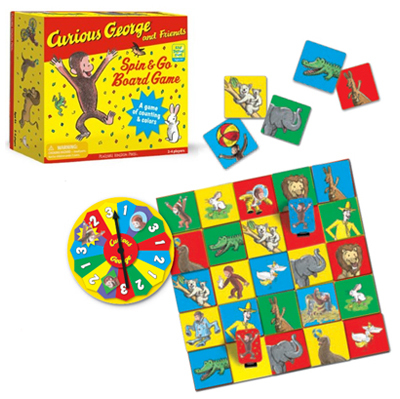 This game is very similar to the other 3 spin and go games, but this time you get to be Curious George! Make friends with the other animals and the man in the yellow hat. Collect the most tiles to win the game. For ages 4 and up. 2 to 4 players. Art by H.A. Rey. This is a simple game that is intended for children that are just learning to play games. 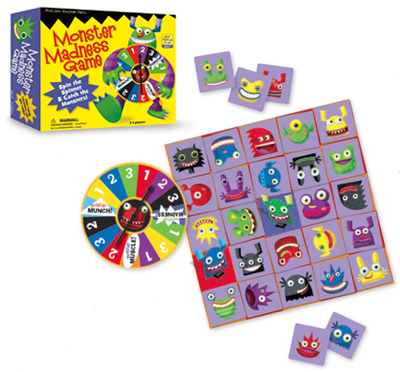 Set up the tiles on the board, spin the spinner, move your marker and collect monster tiles. It’s a spin and move game that involves much more luck than skill. I like to design games for young children that have a high degree of luck. This way, children can win against their parents even when they’re just learning the basics of game play, such as taking turns and being a good sport.This product is the proud winner of a 2008 Creative Child Magazine Preferred Choice Award! For ages 4 and up. 2 to 4 players. Art by Chris Lensch. 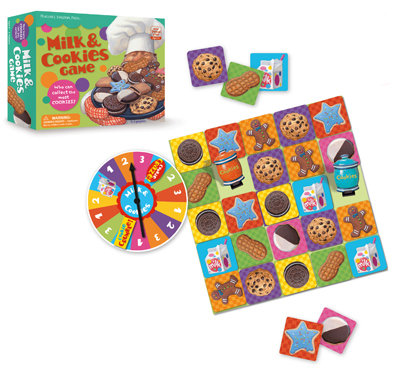 Although the theme has changed, the basic game play in the Milk and Cookies Game is much the same as in the Monster Madness Game. This product is proud to be one of Doctor Toy's 100 Best Products of 2008. For ages 4 and up. 2 to 4 players. Art by Steve Johnson and Lou Fancher. 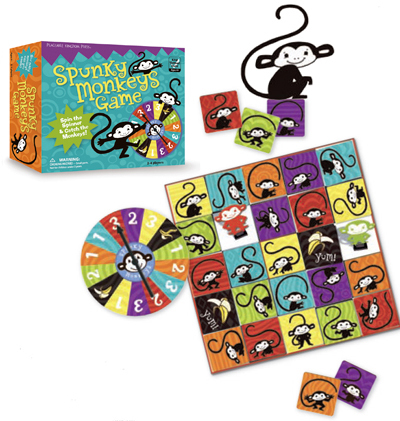 Although the theme has changed, the basic game play in the Spunky Monkeys Game is similar to the Monster Madness Game. For ages 4 and up. 2 to 4 players. Art by Divya Srinivasan.